The rich field of urban law has thus far lacked a holistic and concerted scholarly focus on comparative and global perspectives. 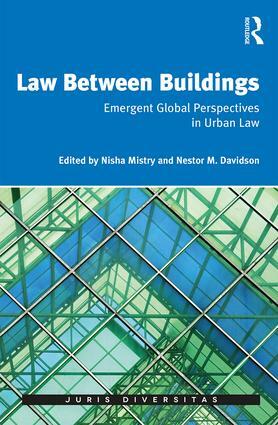 This work offers new inroads into the global and comparative streams within urban law by presenting emerging frameworks and approaches to topics ranging from urban housing and land use to legal informality and consumer financial protection. The volume brings together a group of international urban legal scholars to highlight emergent global, interdisciplinary perspectives within the field of urban law, particularly as they have import for comparative legal analysis. The book presents a timely addition to the literature given the urgent legal issues that continue to surface in an age of rapid urbanization and globalization. Nisha Mistry serves as Director of the Fordham Urban Law Center at Fordham Law School. Previously, she served as a policy advisor to the City of Newark, New Jersey (U.S.A.) on matters related to manufacturing and industrial revitalization. She has also served as a Mayor’s Office Fellow and Nonresident Fellow with the Brookings Institution’s Metropolitan Policy Program. Nestor M. Davidson is a Professor of Law and Associate Dean for Academic Affairs at Fordham Law School, as well as the Faculty Director of the Fordham Urban Law Center. Professor Davidson previously practiced with the firm of Latham & Watkins and served as Special Counsel and Principal Deputy General Counsel at the U.S. Department of Housing and Urban Development. Rooted in comparative law, the Juris Diversitas series focuses on the interdisciplinary study of legal and normative mixtures and movements. The interest is in comparison broadly conceived, extending beyond law narrowly understood to related fields. Titles might be geographical or temporal comparisons and could focus on theory and methodology, substantive law or legal cultures, or could investigate official or unofficial 'legalities', past and present and around the world. And, to effectively cross spatial, temporal, and normative boundaries, inter- and multi-disciplinary research is particularly welcome.